The contemporary split level house at 5 Langdon Road on Canfield Island is a private waterfront oasis with a lagoon, beach, dock and outdoor fireplace. WESTPORT — A private waterfront oasis at 5 Langdon Road on Canfield Island awaits its next owner and just in time to enjoy the summer season. This is the place to be for year-round living and entertaining but the summer months are especially enjoyable on this gated island and on this particular property because of its wealth of recreational amenities. “This shining jewel is found on the furthest point of the exclusive and gated Canfield Island and invites you to luxuriate in unparalleled privacy on the Gold Coast with unrivaled seascapes and nearly 360-degree water views,” according to the listing agent. Canfield Island has few homes to begin with - only about a dozen, and this one is set in one of the most secluded locations on a 2.53-acre level property that features a private lagoon, two personal docks, stone patios, a fire pit and an outdoor fireplace. The lagoon provides a swimming sanctuary for residents and their guests, and it also protects the house and its surrounding property. During severe storms the island has flooded but this house has not. Although the island is in Westport’s Saugatuck Shore neighborhood it can only be accessed by driving into the City of Norwalk. 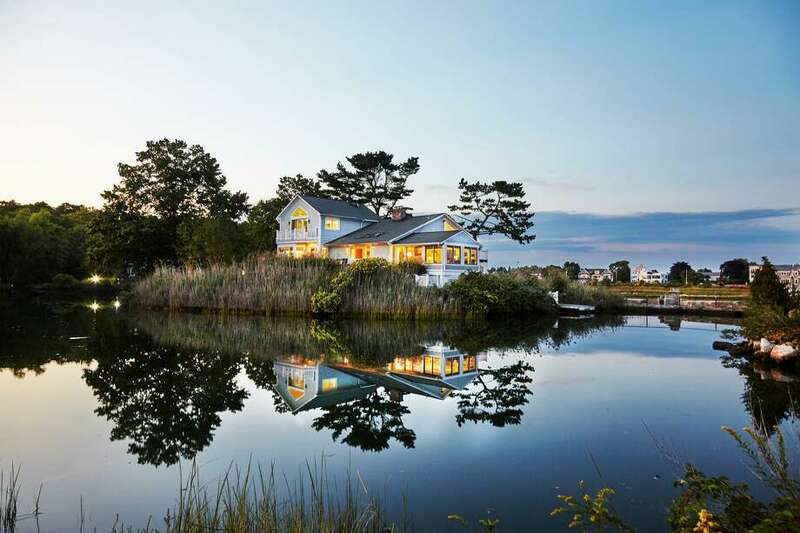 Drive by Shorehaven Golf Course, through the private gate and over the wooden bridge to access this island community on the Norwalk-Westport lines. The 2,609-square-foot contemporary split level house has been showcased in several magazines because of its spectacular views and the lifestyle it affords its owners. The house features walls of windows and an open concept floor plan providing water views from virtually every room. Several exterior vantages points also enjoy views including from the wrap-around Trex deck and balconies. The house was built in 1965 and is perfectly adequate as it is, but one person pointed out this house has not reached its full potential. There are options available. There is room to expand the living space or the existing structure can be leveled to make room for new construction that could include a rooftop deck and an infinity pool. There is a pool site on the property. As it currently exists the house is accessed from the ample crushed stone driveway by a wide bluestone path lined in Belgium block. The formal living room has a vaulted ceiling, skylights, and a brick fireplace with a large decorative beamed mantel. Step down into the sunroom but, as the listing agent said, in this house “every room is a sunroom,” and she has a point. The actual sunroom has a sliding door to a stone patio where the outdoor fireplace is located. The recently renovated kitchen is open to the eat-in area, separated only by a quartzite-topped peninsula, and it features a backsplash of pale gray glass, Wolf six-burner range, Sub-Zero refrigerator, and a door to the wrap-around deck. The choice of colors in the kitchen were deliberate to give the impression of walking on the beach, according to Joseph Najmy, founder of NuKitchens, which did the remodel. On the finished lower level there is a family room with a fireplace and built-in desk area, a guest bedroom, and a full bath between the two. There are sliding doors to one part of the grounds and another single door to another outdoor area. On the second floor the master bedroom suite has sliding doors to a private balcony/deck, skylight, walk-in closet, and marble bath shared Jack-and-Jill-style with a second bedroom. On the third floor there is another bedroom. This one has a vaulted ceiling, ceiling fan, built-in desk area with bookshelves, and a door to a private Trex deck. Its bath features Esmeralda marble floor and backsplash, reminiscent of the water of Long Island Sound just outside. “This place massages your spirit,” another agent said.